NABLUS (Ma’an) — Thousands of Palestinians marched in the funeral of Ahmad Izzat Khatatbeh, 25, who died on Thursday from wounds [inflicted] by Israeli forces at the Beit Furik checkpoint in the occupied West Bank last week. The procession set off from the Rafidia Government Hospital to Khatatbeh’s family home located near the village’s entrance. His body was carried on the shoulders of fellow residents to the cemetery, as they shouted slogans calling for revenge. 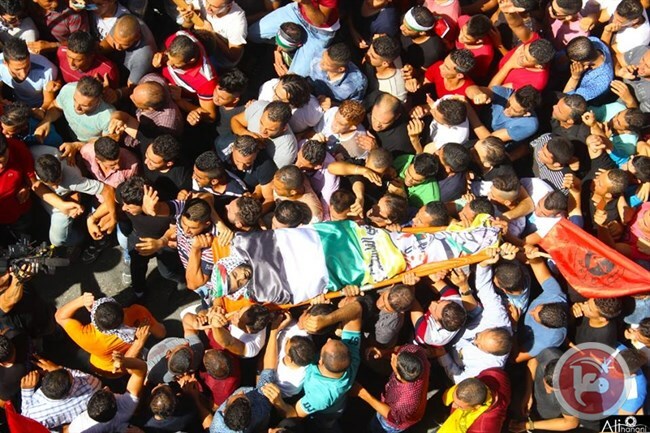 Mourners waved Palestinian flags as well as the flags of Palestinian factions during the funeral. Palestinian security sources told Ma’an that clashes erupted at the Beit Furik checkpoint between Israeli forces and dozens of youth following the march. Israeli forces fired tear-gas bombs and stun grenades at youths causing severe tear-gas inhalation. Medical sources said that a youth identified as Hammudeh Walid Hanini was injured with live bullets in the leg before being taken to the Rafidia Government Hospital for treatment. Israeli forces also fired rubber-coated steel bullets at youths who responded with rocks and set several tires on fire. An Israeli army spokesperson told Ma’an she was unaware of any Palestinian injuries during the clashes, adding that an Israeli soldier had been lightly injured. Khatatbeh had died from his wounds after being shot three times in the shoulder, chest and abdomen, medical sources told Ma’an Thursday. He was the third Palestinian to die at the hands of Israeli forces in the occupied Palestinian territory this week. Diya Abdul-Halim Talahmah, 21, was killed during clashes with Israeli forces in Hebron on Monday. On Tuesday, Israeli forces shot Hadeel al-Hashlamon, 18, several times at a Hebron checkpoint and she died from her wounds shortly after. At least 26 Palestinians have been killed by Israeli forces since the start of 2015, as rights groups criticize the excessive use of force used by soldiers in the occupied Palestinian territory.